Age: Barely 6 months old! Brewer’s details: Kaite Loomes previously worked in the restaurant business and food industry so she knows more than a thing or two about flavour. 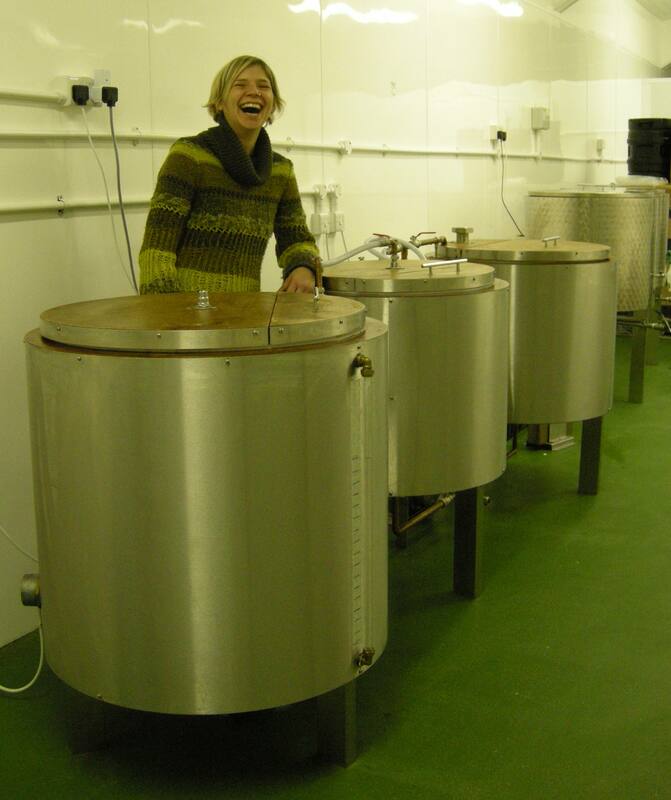 She started home brewing in 2010 and after working hard to learn the craft and experimenting with various beers and flavours realised that her skills had commercial potential and so decided to start a brewery. Compact & bijoux: Kaite with her one barrel brewing kit. What’s their story? : Currently brewing just for bottle Kaite has sensibly started up using a compact and bijoux ‘one barrel’ brewing kit that nevertheless gives her more than 200 bottles worth each time she brews. She is also experimenting with putting her beers in keg and, in particular, is interested in keg conditioning. As I understand it this technique uses a keg lined with a bag in which the beer undergoes secondary fermentation (just like cask ale) but is dispensed by CO2 outside the bag which forces the beer out by squashing it rather than by coming into contact with the beer itself. Hence, cask-like flavour but cooler and fizzier – in a good way. Sounds exciting to me. I hope she makes a go of it. 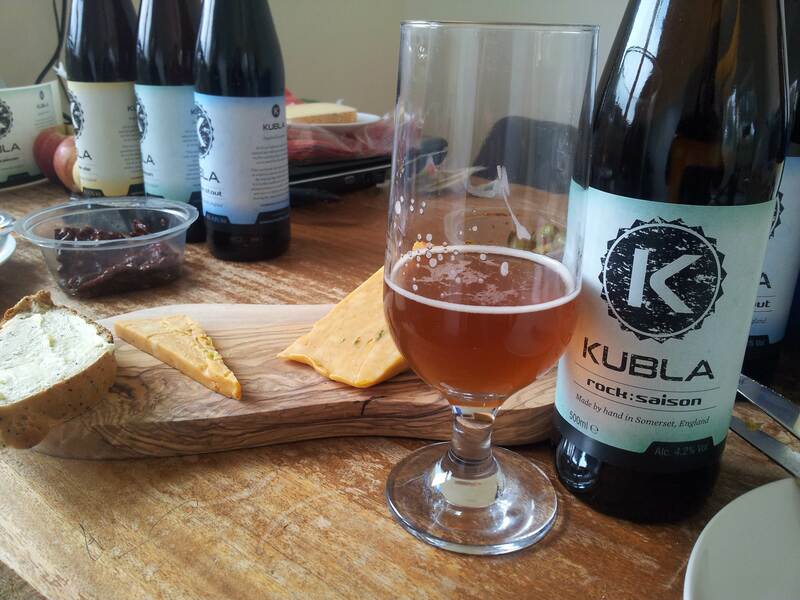 The brewery is named after Samuel Taylor Coleridge poem’s Kubla Khan. Coleridge lived near Exmoor and also spent time walking in the Quantock Hills and the brewery is not too far from either. Beers: Kaite describes her beers as being ‘inspired by nature’ and has named them accordingly, Rise Pale Ale for the sunrise, Rock Saison for the rocks of Porlock beach for example, whereas her Paradise Stout is so-called because of another Coleridge connection. Inspired by the nature – and therefore Mother Earth – they may be, their taste on the other hand is quite heavenly! (Sorry I couldn’t resist). Just the three beers are brewed at present although there may be seasonals in the future. Rise Pale Ale (4.2%) is a modern take on a classic English bitter. A burnished amber coloured beer with a peachy, slightly floral aroma and extremely drinkable tangy caramel and fruity flavours reminiscent of apricots and marmalade. It also has a good hoppy bite. Kaite suggests trying it with Comte cheese which I can vouch for as a good complimentary match which also brings out citrus flavours in the beer. Kaite also says it is a good match for fish and seafood dishes, especially mussels. Rock Saison (also 4.2%) is a gorgeous copper-orange coloured beer with a big floral aroma which may be down to the lavender and chamomile Kaite adds to the brew – although it also reminded me of jasmine flowers. The flavour of the beer is beautiful. Orange blossom and mandarin, elements of jasmine (think jasmine tea) and a light, flowery but subtle sweetness. Although it has a very floral character this beer, like the pale ale, is incredibly drinkable and refreshing – so don’t be put off by my flowery description! Try matching it with Ilchester Mexicana cheese because the spicy peppers work better than you’d imagine with the floral flavours. I also tried it with a lemon and poppy seed loaf that I made. Butter the bread and pop a bit of the chilli cheese on top, wash it down with the beer and you’ve got a simple but delicious lunch with beery flavour harmony. Paradise Stout (4.8%) is a dark mahogany coloured beer with a sweet aroma of damsons and raisins. Flavour wise it is a tangy, fruity affair with some dryness that gives way to a more light, juicy flavour. It’s not as hefty as some stouts but neither is it lacking in body. Kaite adds chicory and coffee to this brew which really brings something to the party. Try it with slices of cold roast beef. 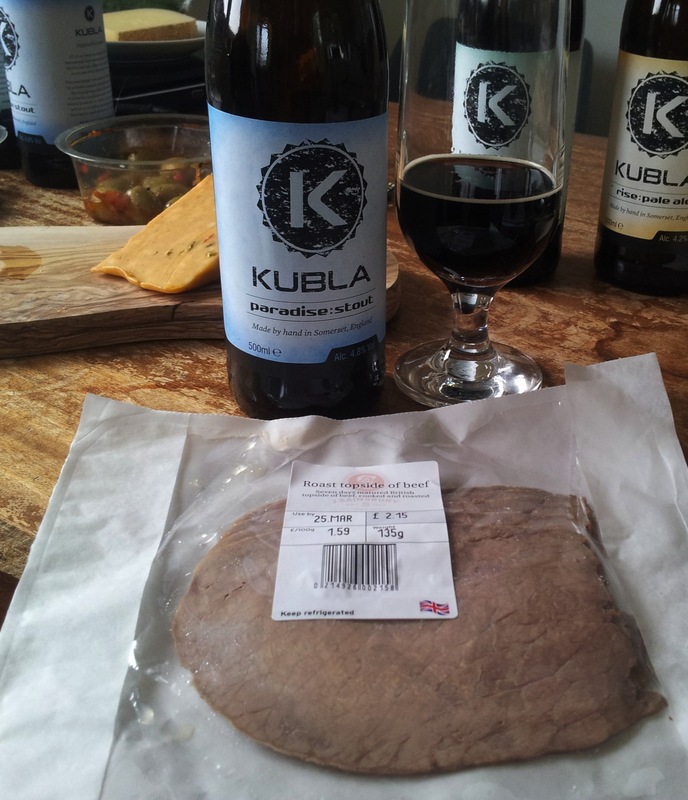 The sweet, juicy meat combines with similar flavours in the beer. I suspect it would also work well with hot roast beef, roast potatoes and parsnips – but I’ve yet to give that match a try. Verdict: You can tell Kaite took her time to develop her brews and get them just right because they have flavours that clearly qualify them as ‘It Beers’. 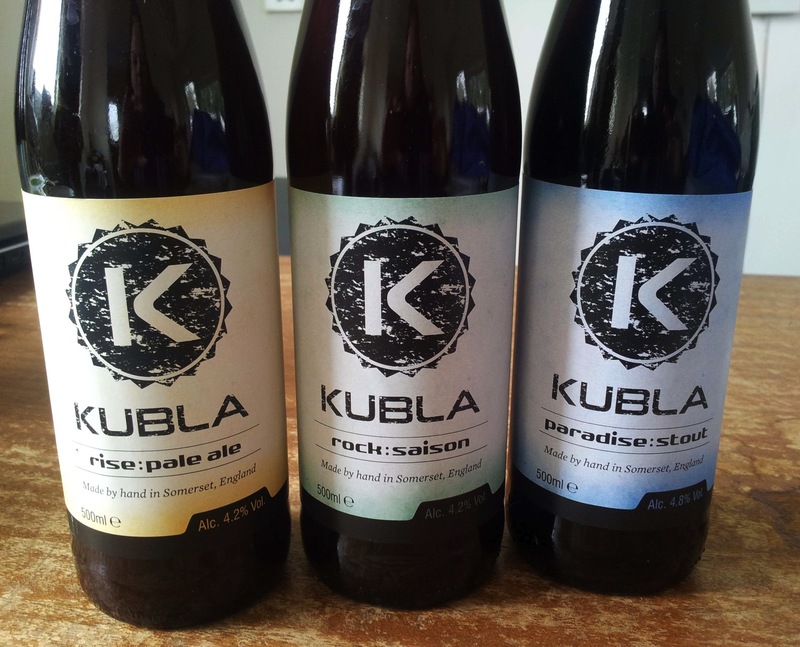 Best enjoyed while young and fresh (but frankly they are so drinkable you won’t have bottles hanging about for long) I look forward to seeing how the keg plans come off and hope it won’t be too long before Kubla Brewery’s beers are more widely available. Until then, get thee to Somerset, or order online so you don’t miss out. Stockists include specialist shops such as Teign Cellars and Tucker’s Maltings in Newton Abbot (or online); Cotteridge Wines in Cotteridge (just South of Birmingham, near King’s Norton) and just one pub, The Plough in Taunton. You can also sometimes buy direct from the brewery on Saturdays – check opening times on their Facebook page or Twitter before you go! Previous Pig and Porter… you know you oughta! Cheers Phil. Let me know what you think when you’ve tried them!